Black box data is the ne plus ultra of aircraft accident investigation. But it is not the only kind of physical evidence. Pieces of debris—in particular, their dents and fractures — can tell a vivid story by themselves. There are five basic ways that an object can break. The two most important for our present discussion are tension and compression. A tension failure occurs when something is pulled apart—think of pulling the ends of a piece of string until it snaps. Compression is the opposite; it’s what happens when something is crushed by a weight or smashed in an impact. When a plane crashes, it’s common for all different parts to exhibit different kinds of failure. Imagine a plane whose wingtip hits a tree. The impact would crush the leading edge of the wingtip—compression failure—and then wrench the wing backwards from the body of the plane, causing a tension failure at the forward wing root and compression failure at the aft end. By collecting many pieces of debris after a crash, investigators can place the mechanical failures in a chronological order to tell a story that makes sense, much as you might arrange magnetic words on a refrigerator. This is how the mystery of TWA 800 was solved. When the fuel tank exploded, the pressure pushed the fuselage skin outward so that it came apart like a balloon popping. The plane broke into two major parts that smashed apart when they hit the ocean. Thus tension failures predominated in the first phase of the catastrophe and compression failures predominated later. So now let’s turn to the issue at hand. What story do the pieces of MH370 debris tell? 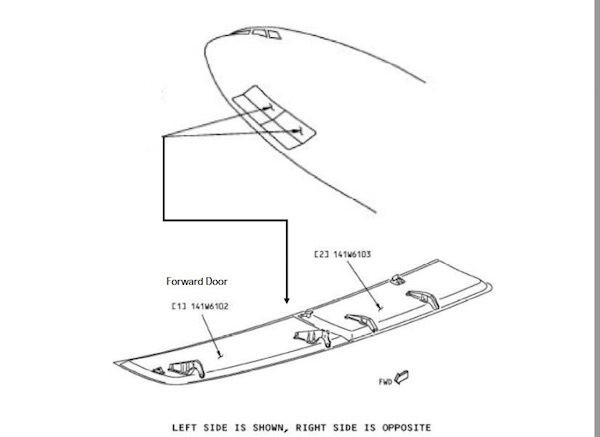 Item 15 (Upper Fixed Panel forward of the flaperon, right side): “The outboard section had the fasteners torn out with some of the fastener holes still recognizable. The inboard section was observed to have signs of ‘net tension’ failure as it had fractured along the fastener holes. Note that all of these but one failed under tension. The exception is item 22, which came from the tail—specifically, from near the leading edge of the vertical stabilizer. It’s particularly remarkable that Item 18, the nose gear door, failed under tension. (Image at top) If, as the Australian authorities believe, the plane hit the sea surface after a high-speed descent, this part of the plane would have felt the full brunt of impact. I spoke to a person who is involved in the MH370 investigation, and was told that officials believe that that observed patterns of debris damage “don’t tell a story… we don’t have any information that suggests how the airplane may have impacted the water.” Asked what kind of impact scenario might cause the nose-gear door to fail under tension, it was suggested that if the gear was deployed at high speed, this could cause the door to be ripped off. This explanation is problematic, however. According to 777 documentation, the landing gear doors are designed to open safely at speeds as high at Mach 0.82 — a normal cruise speed. The plane would have to have been traveling very fast for the door to have been ripped off. And to be deployed at the end of the flight would require a deliberate act in the cockpit shortly before (or during) the terminal plunge. The experts I’ve talked to are puzzled by the debris damage and unable to articulate a scenario that explains it. “The evidence is ambiguous,” Waldock says. A mid-air failure, of course, is inconsistent with the analysis of the Inmarsat data carried out by Australian investigators. So once again, new evidence creates more questions than answers. UPDATE 5/25/17: In the comments, we discussed the possibility that the front gear door could have come off in the process of a high-speed dive. @ALSM speculated that the loss of engine power upon fuel exhaustion could have led to loss of hydraulic pressure, which could have allowed the gear doors to open spontaneously, and then be ripped off in the high-speed airstream. But he reported that Don Thompson had dug into the documentation and confirmed that following a loss of hydraulic power the gear would remain stowed and locked. Thus it seems unlikely that the gear door could have spontaneously detached in flight, even during a high-speed descent. UPDATE 5/25/17: There’s been some discussion in the comments about flutter as a potential cause of inflight breakup, so I thought it would be apropos to add a bit more of my conversation with the accident investigator involved in the MH370 inquiry. Q: Does the MH370 flaperon look like flutter to you? A: In a classic sense, no, but where you would be looking for flutter would be on the stops, on the mechanical stops that are up on the wing, so the part of that piece that came out. And in looking at that piece, you’ve got different types of failures of the composite skin that don’t appear to be flutter. It just looks like kind of an impact-type separation. So it looks like you’ve drug that thing either in the water or on the ground or something. But it’s a little hard with that one because you don’t have any other wreckage, so, one of the keys — you don’t base anything on one small piece, you’re trying to look at kind of the macroscopic view of all the wreckage to make sure that, “Oh, if I think this is flutter do I see the signatures elsewhere on the airplane?” Typically we won’t base it on one piece like the flaperon. Q: I can think of a couple of cases where there was flutter, where the plane got into a high speed descent and stuff got ripped off. Q: Where would that fall in the bestiary of failures that we talked about earlier? A: So flutter’s kind of a unique thing, and it’s based on aircraft speed and structural stiffness. So, you know, when those two things meet you get this excitation, an aerodynamic excitation of a control surface which will become dynamically unstable and start going full deflection. So for a flutter case you generally look at the control stops—so there’s mechanical stops on all the flight controls—and you look for a hammering effect on the stops. So repeated impacts on the stop will tell you that, hey, maybe you’ve got a flutter event. Q: But if you see the piece—there was a China Airlines incident, the elevator was shredded, or part of it was ripped off. What would that look like? A: Mm-hmm. You know, it’s going to be different for every single case. Sometimes that flutter will generate the load in the attachment points, break the attachment points, and other times it will tear the skin of the control surface, and so you’ll see this tearing of the skin and the separation of rivet lines, and everything. I’ve seen both. I’ve seen a control surface that comes apart at the rivets, and flutters that way, and I’ve seen them where it generates loads to break the attachment points. It depends on the loads that are created and how they’re distributed throughout the structure. For his part, Bill Waldock told me that the tensional failure of the collected debris implies a shallow-angle impact. Both experts, in other words, believe the debris is most consistent with a more or less horizontal (rather than high-speed vertical) entry into the water. This is not consistent with the ATSB’s interpretation of the BFO data unless we posit some kind of end-of-flight struggle, à la Egyptair 990, or last-minute change-of-heart by a suicidal pilot. Either seems like a stretch to me. Not convinced that any of the mentioned reason for the duplicate call make too much sense. However, perhaps the covert ‘coded message’ to some person or persons on the ground is most likely. There is another simple way the message could have been used covertly to alert ATC that all was not well without collusion – if the plane was actually flying at a different flight level than the 350 the pilot had twice confirmed. This coming after the refuted (scrubbed?) previous “All right – good night” message? It’s my understanding Boeing don’t tend to use unequal area pistons in the actators on their primary flight controls. @HB, TBill. Thank you. On TBill’s, “….are you saying like Ge Rijn maybe the flaperon came off on hitting water or pull up out of a dive?” There may not be a short answer to that other than ‘I don’t know’. Here in case it helps is an expansion of that. 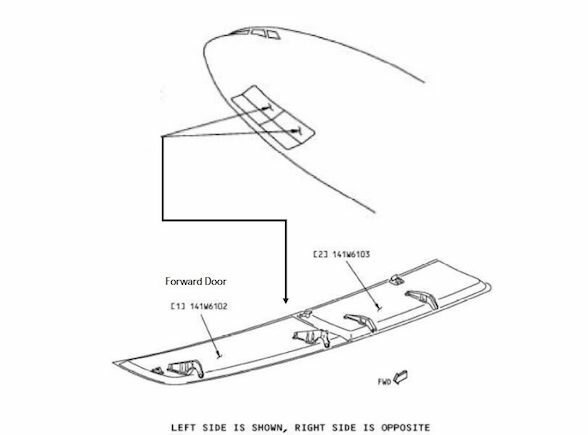 Supposing the ATSB has it right in its analysis that most likely the outer flap was retracted when its inner part separated and the flaperon likewise was in its neutral position or close to, then what apparently follows is that a flaps-extended ditching is ruled out. In any case the engine in front of them should offer wake protection from waves if not more. In a flapless ditching close to stall there would be water impact still but I do not know whether that would exceed the air loading both are designed for when fully deployed. It might not break their attachments or even their trailing edges. But then throw in a flat AF447 descent, which would add loads, and ….? Again supposing the ATSB has it right, the flaperon might have been overloaded by ‘g’ in a steep descent, one attachment failing and that progressively overloading the remainder, the flaperon’s trailing edge breaking away at that time or later. Another possibility is an all-at-once shock resulting from wing breakage under high ‘g’ in flight. For my part even shock on hitting the sea at high speed is not ruled out, even if unlikely. 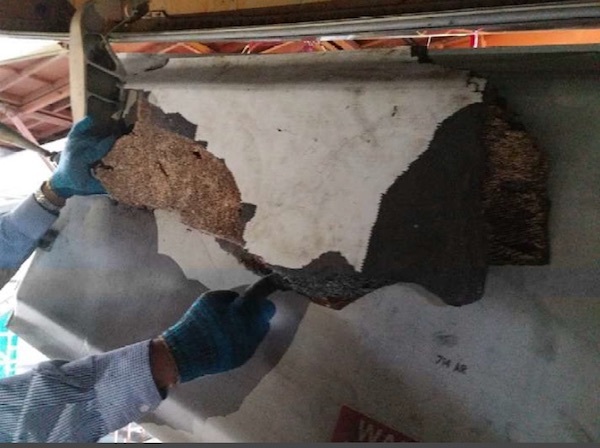 Part of the MH17 outer flap, like MH370’s flaperon and outer flap part, exhibited little ‘mangling’ after ground impact, particularly to the leading edge. It looks to have been ejected. Tom Kenyon has made a case that overstress failure of attachments should be evident from structural deformation in recovered items. To me even were there a fatigue failure in a flaperon attachment as above, that would be followed by overstress fractures in its remaining 3. Yet there is no differentiation between the appearance of the 2 actuator attachment structures or the 2 hinge failures. So there were either 4 simultaneous fatigue failures or 4 overstress failures. Four simultaneous fatigue failures I think is most unlikely. Returning to the ATSB analysis, is that all there is to it? For example, while apparently it rules out a ditching with flaps extended it could be that the flaps would be forcibly retracted, that is before separating. They are extended by a lengthening ballscrew which conceivably could buckle under ditching loads, or at least that at the inner support mechanism’s could. Then again for compliance with the ATSB finding the flaperon would need to get to neutral too before the contact between the two. Besides, because the flaperon and flap were in contact when retracted/neutral does that mean they necessarily separated together? So there is insufficient analysis made public to draw bottom line deductions as I see it. An example of where the puzzle needs pieces which fit is the damage to the flaperon outer leading edge. What did that strike? There is a fixed panel in front of it but that is also below, probably has insufficient strength and would be too sharp to inflict such blunt damage. Presumably the results of such investigations would be with the Malaysians. Extensive designer/manufacturer (mostly Boeing) input would be needed in any reconstruction. Quite possibly there is much yet to be revealed on this topic (and also on bio-analysis). However it may be that even this will not provide the answer you seek. I have been looking into the outer flap failure. It is not easy to get a rational failure sequence together. For example, the stiffener beneath the auxiliary support track, that which stabilises the flap’s inboard end, has been struck by the track’s free end at least 3 times in separate places. Associated, whereas the flaperon rear spar hooked under the flap’s inboard top skin, where in the sequence was that and was it with the flap descending or the flaperon rising? I might be able to post something about this shortly but currently the prospect of that contributing confidently to your question is low. Yes, we can still only speculate with the limited information that’s available on the debris. -broken away trailing edges with the flaperon, left wing aileron and from both outboard flaps. -almost intact leading edges and profiles of the flaperon and right wing outboard flap section. -broken away hinges that probably stayed on the wing end spar leaving only remains on the flaps. -tail section and trailing edges hitting the water first under a ~low angle of attack and relatively high forward speed. -causing a forcefull momentum on the hinges which rapidly varies due to the numerous waves that hit the underside of the flaps. -causing fatigue and stress damage in the hinges that progresses. -trailing edges start to brake away first followed by the failure of the weakened hinges on their weakest points; their attachments on or near the flaps (not on the wing spar which are stronger). -the none-actuated inboard PCU of the flaperon fails first while it’s in a free moving mode forcing the inboard side of the flaperon backwards and up. -which causes the outer outboard side of the flaperon to dent the inboard side of the outboard flap. -the upwards rotating torgue of the flaperon than snapps the actuated outboard PCU hinge on the flaperon skin releasing the flaperon backwards leaving its leading edge and overall structure faily intact. I assume a same failure sequence happened to the outboard flap section. -first the breaking of the trailing edge on the outboard side part near the big strong hinge. -then also an upwards movement in which the rotating torque on the big outboard hinge caused this hinge to break and released the section also backwards leaving its leading edge and overall structure relatively intact. I assume this all happened during a short time when the plane skidded over/in the water during a ditch-like entry of the water surface. The kind of damage and the amount of control surface/trailing edge/wing related debris found compared to the only three cabin pieces and almost complete exclusion of other debris found, still leave no other option imo. That said, I’m aware conclusive evidence is still needed. But this still counts for every other scenario too. The scenario you describe is not ruled out. I still think it is bot compatiblebwith the hinges issues. The problem here is that all of us look at a single event scenario. Actually, a multiple event scenario Would fit better the data. I will try to develop a full list of scenarios aa a starting point so all the pieces of information cab be matched. This could also help us identified the unknowns for further research. @Ge Rijn. You are ahead of me. I am still weighing the detail in available evidence. i had a further look at your paper, if there was such a shift in axial load, I would expect the FRP to buckle or honeycomb composite to delaminate as the FRP/honeycomb composite will be very weak for this dynamic loading scenario. I will have another look at the photos if there is such signs. The found fixed upper panels above the left and right wing flaperon. Item no.9 and no.15. Both also show only tension failure and both leading edges (with the rub strip) are intact. Imo they could only have broken away by forces coming from the underside and from the front. Those simultanious forces must have pushed/bended those parts upwards till breaking point and then tear them off backwards. Imo the only combination of forces that could have done that are the forces that occure during a ~level, low AoA, ditch-like entry on a water surface. Then finaly imo the nose gear door piece can not be explained by a nose dive entry while it also shows no compression damage and it would have imploded together with the whole nose section of the plane. It even suggest to me the gear could have been lowered before impact. Maybe to serve as a speed brake during a dive or to accomplish the plane would sink faster after ditching leaving big holes and tears when the landing gear shears off. Small correction on the rub strips of item no9 enad 15: they are on the trailing edge ofcourse.. Thank you for the analysis. I believe Victor has tried to say we do not have a path/crash scenario that fits all of the data – no matter what path/crash hypothesis one develops, it seems inconsistent with something. Closing comments here now, please add your thoughts to the most recent post. Thank you. Next Next post: How Did MH370’s Flaperon Come Off?